Sale of a 1935 Sunbeam motorcycle with Watsonian sidecar by Godfrey's Limited of London. Homepage. 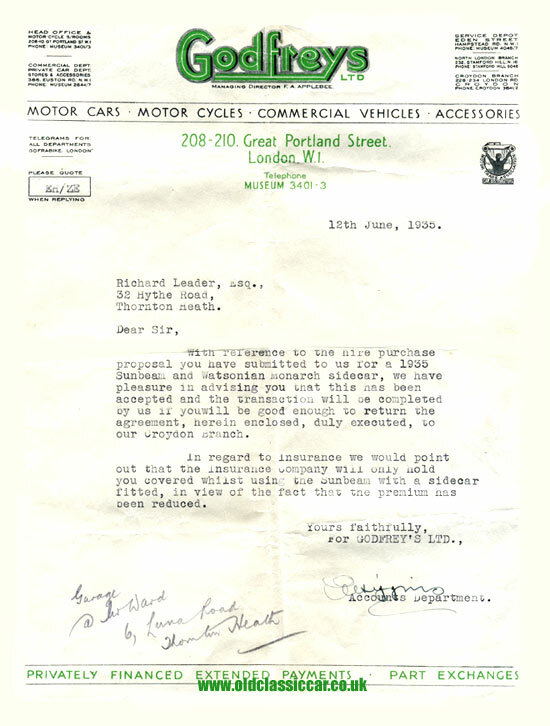 This page: Godfrey's Ltd, sales agent for Sunbeam motorcycles, acknowledges a finance application. Sale of a new Sunbeam motorcycle in 1935. Most items of old paperwork featured here relate to pre- and post-war cars, but every now and then something relating to motorcycles turns up. Here is just such an example, a letter typed up by the Accounts Department of Godfrey's Limited, 208 - 210 Great Portland Street, London W1. In it, the firm advises that Mr Richard Leader's application for hire purchase on a brand new 1935 Sunbeam, with Watsonian sidecar, has been successful. He is also reminded that the discounted insurance rate given is only applicable so long as the sidecar remains fitted to his machine. Godfrey's Limited could be contacted by telephone on 'MUSEUM 3401 - 3', while telegrams would need to be sent to 'GOFRABIKE, LONDON'. The letterheading confirms that the company's head office and motor cycle showrooms were situated in Great Portland Street in London. At their Euston Road premises (telephone MUSEUM 2644/7) you'd find both their Commercial Department, their Private Car Department, and also their stores and accessories outlet. In addition, they also had a service depot on Eden Street, NW1, a North London branch at 232 Stamford Hill, N16, and also a Croydon branch, so evidently this was quite a large garage business. A symbol for the Motor Trade Association (Car Distributors) also features on Managing Director F.A. Applebee's company letterheads. More original items of paperwork relating to classic vehicles can be found in the Motoring Collectables section.